Where are you @? | Less. More. Abundantly. 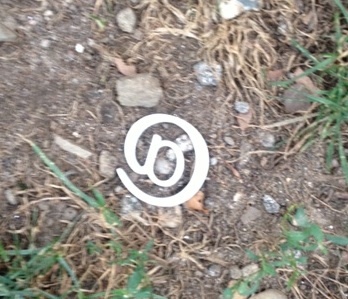 Recently, on a visit to my brother in New York City, I saw a silver glint beneath a tree. So incongruous with the natural terrain, I took a photo. Where am I at in this journey to eat less, pray more and love abundantly? I’ve gained weight. Pray on the fly and recently had an epic fight with the hubby. Needless to say, I am not as far down the road as I would like. Had a mirror moment with a dear friend today. Mirror moments are those rare occasions when someone else shows you something about yourself you never saw before. Standing in my filthy kitchen she gave me a mirror moment. No really-the floor has a trail of melty popsicle drippings resembling a Technicolor crime scene. Where am I @ in my mothering? When I went away for an overnight, my kids ran to the door upon my return and screamed, “You’re FINALLY home!” I was gone less than 24 hours. That’s love abundant. Where am I @ in my career? My boss, the kind of dream boss who is more mentor than bureaucrat, told me to do what I had promised to do. My work, my word, is my integrity-in or out of the boardroom. I pray for more character building moments in the midst of the memos. Where am I @ with eating less? Not.at.all. Someday, just not today. Where am I @ with praying more? I couldn’t get through a day without it. Where am I @ with loving abundantly? I have found love in the most surprising places. In a cuddle with a sweaty little boy while watching a movie. In dropping off a frozen lemonade to my tired salesman hubby. In laughing with friends until 1 a.m. while restaurant staff impatiently look on. In a smile from my Dad in the midst of his painful battle. Where are you @? I would love to hear. Glad you are on the journey with me. Here is a song which inspired me. It’s about choosing the Divine in the midst of the destructive. Had to share. I’ve been working on eating better foods rather than eating less. We don’t even buy pop or junk food when we get groceries. I still have a pop when we go out to eat – so instead of banning it all together it’s more of a treat thing. That helps me, cause I tend to crave things if I’m absolutely not supposed to have them. I am @ …. ever listen to that song by Eric Clapton “Let it Grow?” That is where I am at.